When the ancient evil of the Blackbringer rises to unmake the world, only one determined faerie stands in its way. However, Magpie Windwitch, granddaughter of the West Wind, is not like other faeries. While her kind live in seclusion deep in the forests of Dreamdark, she’s devoted her life to tracking down and recapturing devils escaped from their ancient bottles, just as her hero, the legendary Bellatrix, did 25,000 years ago. With her faithful gang of crows, she travels the world fighting where others would choose to flee. But when a devil escapes from a bottle sealed by the ancient Djinn King himself- the creator of the world- she may be in over her head. How can a single faerie, even with the help of her friends, hope to defeat the impenetrable darkness of the Blackbringer? I did a double-take when a Goodreads friend recommended Blackbringer for my fairy novel “market research” project. For some reason, I was under the impression that Daughter of Smoke and Bone was Laini Taylor’s first novel. (It’s actually her fourth.) And since I’d been meaning to read Taylor’s work for a while, Blackbringer went to the top of my TBR list. Well, I’m now grateful I made that choice, because this was such a treat! Blackbringer introduces readers to Dreamdark, a modern-day forest tucked away from human knowledge and teeming with magic-wielding faeries, hedge and scavenger imps, and djinn. One of the faeries, Magpie Windwitch, has devoted her life to hunting devils in the human realm. When Magpie and her flock of talking crows track down an opened devil’s bottle once sealed by the Djinn King, she knows something is terribly wrong. Her search takes her back to Dreamdark, where she reunites with old friends, meets new ones, and must contend with a suspicious new faerie queen and the standoffish Djinn King himself. But how can she – a tiny faerie – defeat something that is no mere devil, but a vindictive, ravenous evil that threatens to destroy Dreamdark and the world beyond? 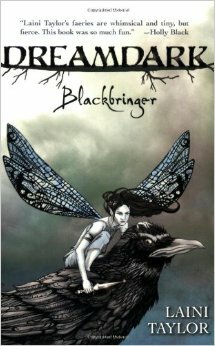 Within a couple chapters, I fell in love with Blackbringer and its rich world-building. The history of Dreamdark and its faeries, and the origin story of how the djinn created Earth, plays a crucial part of the story. Yet it’s sprinkled methodically throughout, and readers learn everything they need to know as the plot unfolds. And Laini Taylor’s writing style… Gosh, it took my breath away! Fluid, precise, and lyrical, all without becoming too sophisticated for a young audience. Her grace with language bolstered everything from Dreamdark’s lushness to the faeries’ ethereal wings and garb, to the mysteries of the Djinn King and the “tapestry” holding the world together. Occasional illustrations from Taylor’s husband Jim Di Bartolo also accentuate the story’s charm. And the characters! Magpie’s a sweet yet spunky tomboy who’s eager for adventure and loyal to everyone she cares about. The crows, especially Magpie’s mount Calypso, entertained me with their comedic relief and devotion to their beloved huntress. Still others like Magpie’s childhood friend Poppy Manygreen and the persistent prince Talon Ratherstring are well-rounded and memorable in their own way. Plus, aren’t the names adorable?? They match the playful spirit of Dreamdark, and are perfect for a Middle Grade fantasy. The Dreamdark faeries are more of the Tinkerbell kind than the dark fey folk of Julie Kagawa’s The Iron Fey series. They’re tiny, winged, and ethereal in appearance, with a range of magical talents. They’re also curious, nature-connected, and zealous fighters. You wouldn’t want to mess with Magpie and crew if you too were the size of a thumb! Taylor also takes advantage of the Dreamdark faeries’ flying abilities by making it part of the action. Swooping, darting, and other aerial-robics turned fights and chases into breathless scenes that played like a movie in my mind’s eye, which only fueled my adoration for the book even more. Have you read Blackbringer? What did you think of it? If you haven’t read it yet, do you think you might check it out based on what you’ve read above? Let me know by commenting below or visiting the same review at Amazon or Goodreads. Yes! BLACKBRINGER is the first book in a duology. 🙂 Do you think you’ll review it for your blog once you’ve read it? I’ve made a note of it… Though I think the clone will have to get involved – my TBR pile is just ludicrous! I haven’t read this or even heard of it until I just read your review. It sounds like something I should check out, though. It sounds interesting. I see you listed this as being good for middle-graders, so this sounds like something I should check out to maybe introduce to my son’s library. My son is not quite middle grade, but he’s an advanced reader and is always placed in the accelerated reader program in school with kids older than he is. I’m always on the prowl for books that are on his reading level that I won’t object to him reading. LOL. It also sounds like something that I might enjoy, too, even though it’s targeted at younger readers. Two birds. One stone. I definitely enjoyed Harry Potter and Inkheart. Golden Compass is still on my TBR pile. My son recently started reading the Harry Potter books. He doesn’t like them. I have such odd children. LOL. LOL! Does he like other fantasy series? Or is this the first one you’re trying out on him? Oh yeah, his personal favorites include anything written by Rick Riordan, especially Percy Jackson. He was over the moon to hear that he’d be starting yet another series that will take on the Norse gods. I think he might appreciate Harry Potter more in a few years. Oh wow, I didn’t even know this book existed! I thought her Daughter of Smoke and Bone trilogy was her first work too, you learn something new every day! Indeed! 😀 Maybe it’s something to add to the fairy books you’ve already read? (I’m recalling the list you compiled for Tough Travelling a while back.) These fairies seem to be different from most of the fey / fae interpretations out there, but Taylor really makes it work. I wasn’t thinking much about it before, but after reading your review and how much you liked it, I might give it a go! First I have to get to all the other books I said I’d read, lol (it’s a long list). 🙂 I’ve never read a book in omniscient POV before, so that will be interesting.